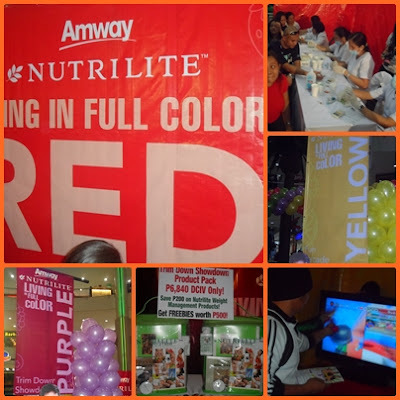 Last Saturday January 7, I had a chance to attend the "Amway Philippines promotes Nutrilite's Living In Full Color this 2012" event held at Market! Market!. The event started around 11AM at the Activity Center of Market! Market! and people also gathered together to support and make their life more healthy for 2012. We were given a passport card at the registration area and instructed to complete it with stamps for us to get a chance to win prizes. Various activities is colored according to Nutrilife's ongoing ColorUrLife campaign scattered around the area and each accomplished activity corresponds one stamp. First is the Red booth, for the health conscious to learn about their body mass indexes, blood pressure, blood sugar, cholesterol and a free consultation after. Yellow booth to play Wii Fitness Games, Green for photo-booth. Finally the Purple booth were registration for Trim Down Showdown Nutrilite Weight Loss Challenge is located. There are also products samples as well as fun games and exciting raffles. The people also had a chance to dance a Zumba which really burned calories within 15 mins.There is also an entertainment part which was Kyla, the R&B and soul princess perform and gave her best shot in performing to motivate the crowd a more healthier way. The highlight also was the presentation of the of Nutrilite's newest brand ambassador- champion swimmer, multi-awarded actor and Kapamilya Network star Enchong Dee. He rendered a dance and gave time for his fans a free photograph with him at the photobooth. A dating game came after which my co-blogger Alice won the exclusive date with Enchong (so lucky girl). A press briefing also conducted with him, so that we got a chance to know him better. The day was full of fun and excitement the healthier and colorful lifestyle way. I was also chosen among 10 bloggers who will undergo the Trim Down Showdown Nutrilite Weight Loss Challenge and they gave us a kit which will help us loss weight in 3 months (wish me luck friends). To know more about Nutirlite's newest brand ambassador Enchong Dee and how you can get your daily dose of at least five servings of fruits and vegetables. 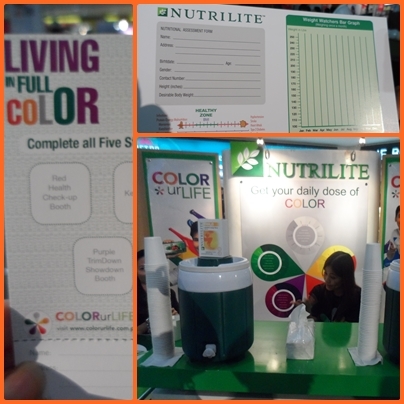 Visit www.colorurlife.com.ph or like them on facebook at www.facebook.com/NutriliteCOLORurLIFE.. To find out more about Amway products and business, Visit www.amway.com.ph or call Amway Philippines at (02) 8148181.